The 2020 Mitsubishi Outlander Sport has been announced, but it is not yet available for purchase. 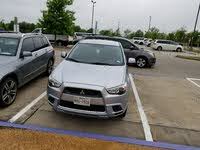 Start a new Mitsubishi Outlander Sport question. My Mitsubishi 2018 Outlander sport wont start. It has no power. Nothing. Dead as a doornail. What would cause that? Car started making a whining sound and seems to get louder when I go in reverse. Completely stops making the sound once I brake but the moment I left off the brake it starts up again.